Create change. Make an impact. Moving ideas and innovating to impact business globally. On Sunday, 27 September, 2015, twenty-eight amateur and professional astronomers and photographers ranging from ages 5 to 65 descended upon the English countryside in Salisbury, UK, to the Stonehenge monument in Amesbury. The reason for this occasion that has been occurring for the past twelve years was to view the full moon rise amongst the stones. Autumn Supermoon rise at Stonehenge. Salisbury, UK. Since 2002, Pete Glastonbury has been organizing this special access event to view the full moon risings for the last 12 years. The first was a special commission for Stonehenge that included renowned archaeoastronomers Professor Gerald Hawkins, Professor Vance Tiede and Professor Hubert Allen. Fast-forward a dozen years and we have English Heritage’s steward Simon Banton as unofficial guide and new generations of astronomers. This year wasn’t any regular autumn full moon rise, but a “super moon” coinciding with a blood full moon in combination with a total lunar eclipse later in the evening. This phenomenon has not occurred in more than 30 years, the last occurring in 1982, and the next one expected in 2033. The perigee full moon, when the moon is closest to the earth (approximately 31,000 miles closer), was fully visible rising from the stone circle of Stonehenge and our group of astronomers were ready with their cameras and tripods to capture the moment as the sun was seen setting directly behind them. Lunar eclipses typically occur about twice a year when the Earth’s shadow blankets the moon from the sun. 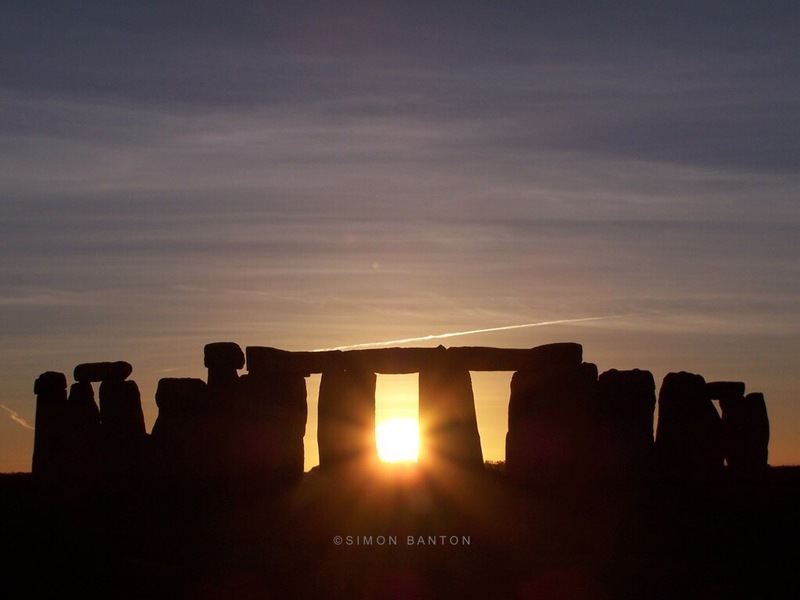 Modern-day scientists and astronomers can predict eclipses many centuries into the future and the stones at Stonehenge were constructed in a fashion that in ancient times communities were using their own methods to predict such occurrences. This fourth and final eclipse of a lunar tetrad was also called the “blood moon” as the moon appears in a reddish-orange brown during full lunar eclipse. English Heritage’s Steward Simon Banton holding a Bronze Age axe head. Stonehenge, Salisbury, United Kingdom. The winter solstice sunset signifies the end of one cycle and the beginning of another cycle. The only unarguable alignment of Stonehenge in the way it was built in the direction facing the winter solstice with a progression in height: Two small, two medium, and one large, increasing in height. Entering the temple is most impressive is what’s facing, framing, or from the heel stone. British-born American archaeoastronomer Gerald Hawkins first proposed that Stonehenge was an an ancient astronomical observatory that was used to predict the movements of the stars and sun. Using an early-model IBM 7090 computer, Hawkins entered the positions of the standing stones and other features of Stonehenge to model the movements and positions of the sun and moon using the positions of 56 holes as markers for the moon and sun to calculate the nodes of lunar orbit twice a day in a 28-day cycle. One of the 56 Aubrey holes at Stonehenge. Somerset’s Chris Starr at Stonehenge examining Bluestones. Todd Howard, 40, another Stonehenge participant who was introduced to these outings through SpaceFest channels, pondered on the construction of Stonehenge. “It was built by intelligent people with astronomical awareness. Too many things that don’t line up to be a full observatory, but it had a huge social element to it,” as people traveled as far as Scotland to feast and celebrate the beginning of the new year. The furthest participant to travel was astrophotographer Jeanette Lamb, 52, who came all the way from Queensland, Australia, for the first time. She has entered local astronomy competitions and has been awarded prizes for her photographs of the night sky and stars. “I cried when the moon rose over the stones. The history and privilege of being allowed at Stonehenge to view the moon rise is amazing. When you live in a country where there is no astronomical society, online communities bring astronomers and space scientists together. The online community is making our world smaller.” Indeed it is. Astrophotographer Jeanette Lamb. Photo credit: Amjad Zaidi. For more on the documentary Pete Glastonbury and Silent Earth are currently filming, including the work of Professor Gerald Hawkins here. This full article can also be found on Silent Earth’s website here. Please enter your email address to follow and receive notifications of new posts by email. © 2019 CLC Advisors, LLC. All rights reserved.